Within a matter of days, the normally purple and gold covered campus of LSU was surrounded in orange. The classrooms were filled with students wearing orange shirts and the hallways were packed with orange posters. Orange fliers scattered the sidewalks and orange magnets traveled on cars. Even the skies shined a shade of orange as a plane flew over campus carrying a large banner that said, “Do you agree with Adam?” This left many students wondering, who was Adam? “I Agree With Adam” was a recent campaign promoted on the LSU campus organized by more than 10 campus ministries. The purpose of this movement was to create awareness for two weeks leading up to an event where “Adam” would share his story. The design of this campaign was to spark a curiosity that would lead to an opportunity for students to share their faith, Adam Roethele said. Roethele, 21, is an LSU senior with a major in kinesiology. He was the “Adam” many people were wondering about, however, he wants to take the spotlight off of himself and turn it towards the mission of the campaign. This campaign was fueled by curiosity. Thousands of fliers, banners and magnets were placed all over the campus. Hundreds of shirts were distributed to the people involved with the campaign. Billboards across the city advertised the campaign. This was all done to get people thinking. Social media was next to take flight. Facebook, Twitter and Instagram accounts were created and each was immediately used to begin spreading awareness about the campaign. All of this created a stir of interest among people. All of the students involved with the campaign were trained to share their testimony with anyone who asked them about their shirt. Garrett, 20, is an LSU junior with a major in horticulture. He is on Refuge leadership at the Chapel on the Campus, which is a program designed to raise up spiritual leaders on the campus of LSU. The weeks of raising awareness led up to the main event on April 3, where “Adam” was revealed. When Adam was exposed, he shared his testimony. 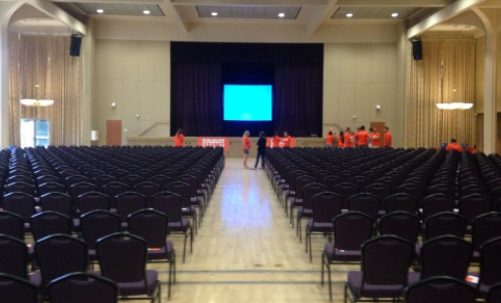 The campaign was held in the Union Ball Room on the campus of LSU and had hundred of students in attendance. However, the most important part of the campaign has yet to come. The weeks following the initial movement play a huge role in the success to the movement. At the event where “Adam” was revealed, people were able to mark down if they wanted more information about the faith that “Adam” has. More than 100 students marked down their name, and each of the 10 campus ministries have been praying over the students by name for opportunities to meet with them and discuss what “Adam” believes. On the other hand, Adam and those who support the movement see a need for more of an outreach on the campus of LSU extending throughout the nations. The ministries involved with the campaign were happy with the outcome of the campaign and look forward to the next few weeks to follow up with students. The campaign was short, but it seemed to accomplish the goal at hand. From those who loved the campaign to those who were opposed to the idea, people were talking about Christ, and that was the mission. Adam Roethele, LSU senior with a major in kinesiology, serves on the leadership team for the Refuge college service. 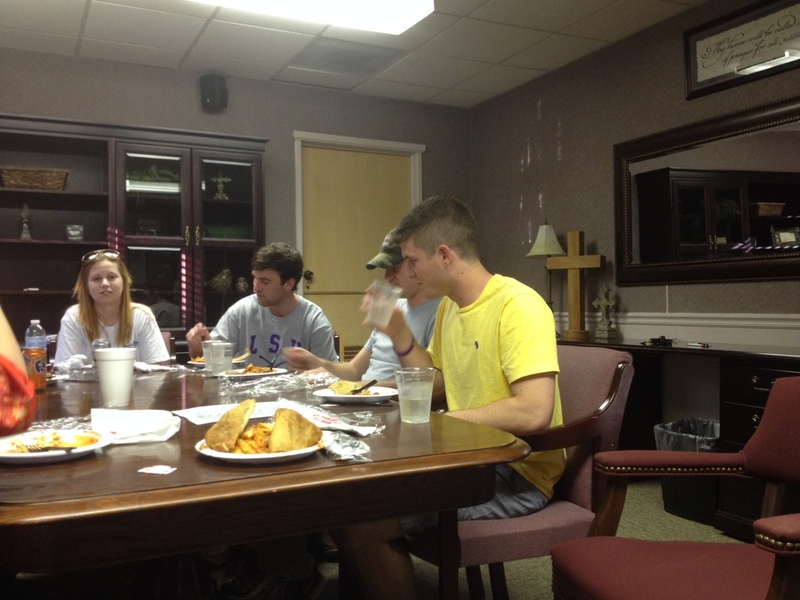 Every Thursday night the team meets to have a meal and prepare for the following week. People running the “I Agree With Adam” campaign met before the event to make sure everything was ready. “Adam” was revealed at the event. 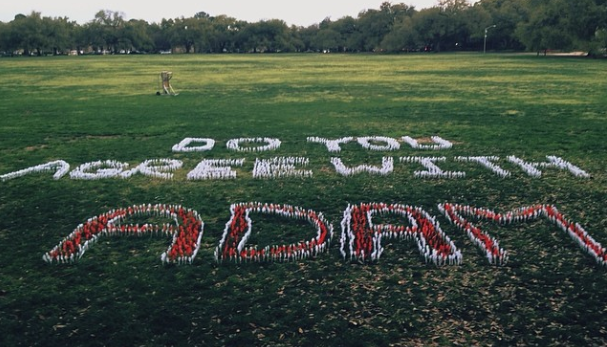 The LSU parade grounds were forked by students to raise awareness for the “I Agree With Adam” campaign. Student spent two weeks promoting the even which took place on April 3.